I decided to open a bottle today. I've been extremely busy with a lot of things recently, so I decided to treat myself to something a little out of the ordinary. Besides, I only had four bottles open. I reached in the back of my cabinet and pulled out an old label/bottle of ORVW 10/107. I opened my bottle of ORVW 10/107 today and had a couple of pours while slaving in the kitchen over my first batch of chill for this season. Then it hit me. I had this month's BOTM. For once I have some things to say. I like ORVW 10/107. It's one of my favorite bourbons. I've had many bottles over the last number of years, and I never had a bad one. I finished a new bottle a couple of weeks ago, and as I said, I just opened an old label. While I perceived a difference in the two, it was minimal. The newer bottle seemed a bit richer and sweeter. The old bottle I just opened has just a little more depth of character to it, for lack of a better term. It seems to have a tad more "oomph" to it. Unlike the wheater it is, there's a nice, slightly spicy edge to it. To me, the old bottle drinks like it's 107 proof, while the newer bottle belies it's proof somewhat. Just a couple more things. I still remember the first bottle of ORVW 10/107 I bought. I found it while on vacation in Florida. My buddy and I, okay, well mostly me, finished it off mid week. Of course I went back and bought another to bring home with me. (pics below) And finally, IMHO, I believe that ORVW 10/107 has probably been the most consistent of the Van Winkle bourbons over the years. There's been times that after tasting them, I turned down Pappy 15 & 20 and LotB, and bought ORVW 10/107 instead. Just my thought. YMMV. About the pics. 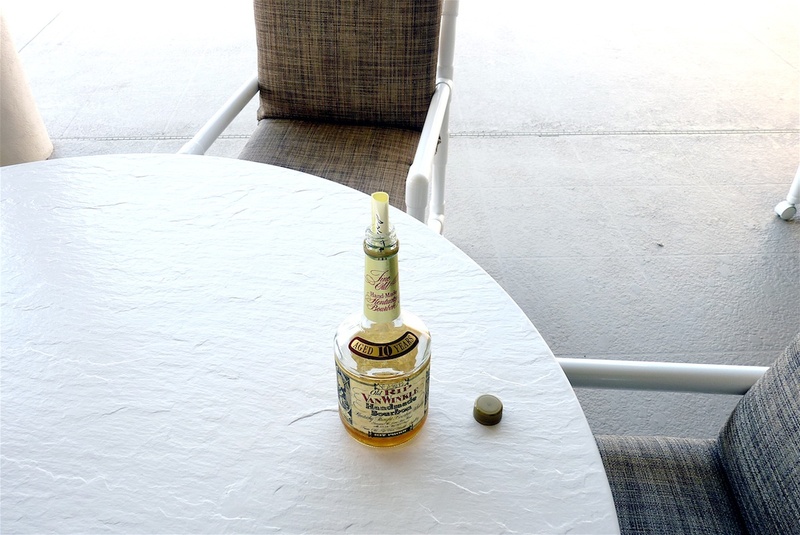 I thought it would be kinda interesting to make it seem like we found the bottle on the table by the pool with a note inside. Just my way of having some fun. I've had only a few of the ORVW 10/107 bottles. Very hard to find up here in the Mitten State for quite a long while. I agree with you, Joe; the 10-year 107 has been remarkably consistent over the few that I've had (Old & New) over about 7 or 8-years... and always a great pour. Sweeter than almost anything else I've tried, which isn't to say it's been too sweet; just more sweetness than almost anything else. And, not without it's complexity. Big Vanilla, a good deal of cinnamon, and no small amount of barrel influence. An all-around excellent selection for BOTM. Cheers to your choice, Joe! Great choice. My favorite currently produced bourbon. Love OWA, but the extra few years do make a difference. Did this blind side by side with OWA and an OWA single barrel. The Rip was an easy winner and easy to pick out. Joe I'm with you that I like this better than the BT versions of Lot B and PVW 15. I like it better than the Lot B, although there's nothing wrong with that one either. Never had the older bottling, but I've been lucky enough to pick up at least one each of the past few years. IMO, the 'pre-Pappy' squat ORVW's were the best. Being it was the only dame in the bar (at the time), you were getting the best iteration of the product. ORVW10/107 is one of my all-time favorite pours. 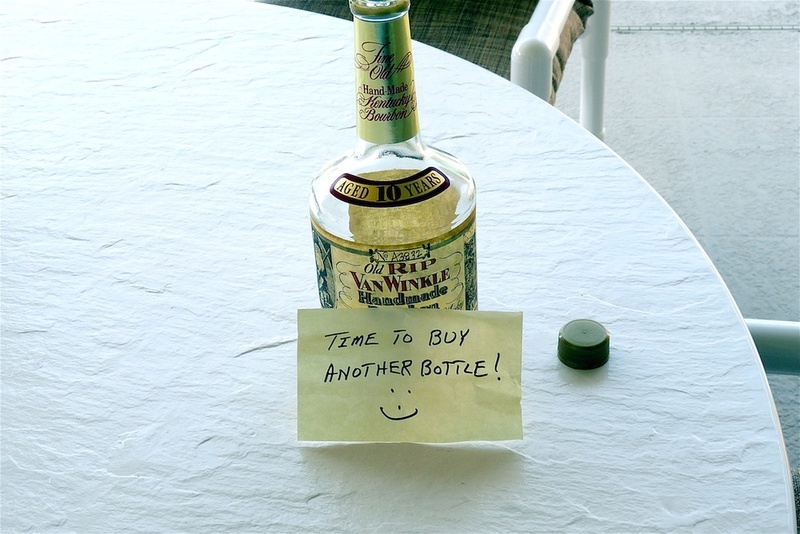 Unfortunately, the last bottle I bought was on 12/11/14 for $49. Have not seen another bottle anywhere since. If any of you SBers say, "Oh, we got boatloads," please say where. I can't speak to the consistency since I've only drank one bottle so far. I was fortunate enough to find 3 bottles in 2014, all at retail establishments but two were a bit more than I would have liked to pay (though clearly I paid it). I opened one for my bachelor party last year. We had a tasting of a handful of whiskies at my house after a steakhouse dinner (ORVW10/107, HWMWND, Redbreast 12, Highland Park 18, Macallan 12, and a local distillery's bourbon for the out-of-towners). 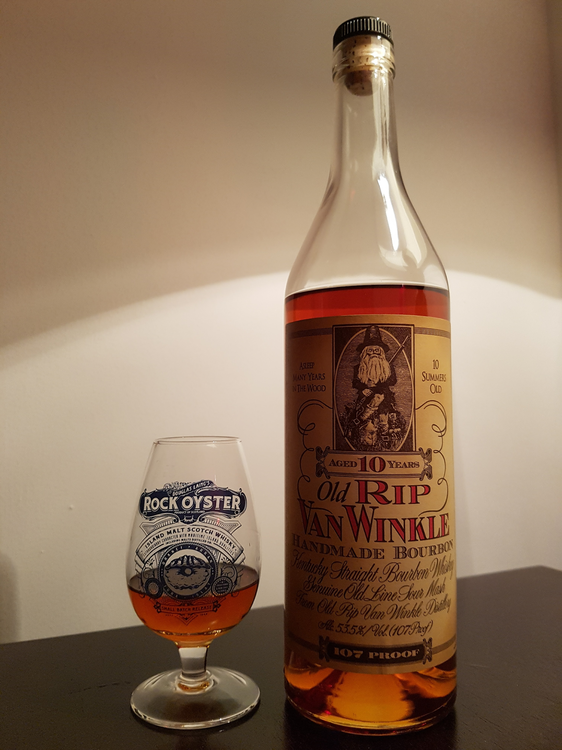 ORVW10/107 is definitely a very good bourbon. I didn't do a side-by-side with the SB Blend but tasting separately, I realized two things: 1.) the SB Blend is a good approximation for ORVW and 2.) the ORVW is more delicious in every way. I need to drink down my current open inventory but I think my next bottle of ORVW10/107 is pretty high in the queue of bottles to open next. Side note: One of my bottles had a significantly lower fill level (pictured in the middle). Upon further inspection, there was dried bourbon residue on the foil wrapper and when I opened it, there was a cork void that clearly was the leakage path. I contacted BT just to inform them of the cork manufacturing issue (I'm an engineer in product development, so it comes naturally ) and they requested I mail them the cork for analysis. So hopefully all of the future bottles are tight as a drum thanks to my tireless efforts! Was able to buy 4 2015 ORVW 10/107's. They ranged anywhere from $55 to $68. 2 bottles are gone and I have enjoyed every sip. Can't compare to the older bottles, because I don't have them. This is a top of the line Bourbon, but is hard to come by. Thankfully I bought several OWA's that will hold me over for a while. Good Stuff! The ORVW 10s have been some of my favorite of the line whose name bears no repeating. I absolutely love OWA, and ORVW to me was like cherry barrels of that with a bit more going on. My sweet spot in terms of age is usually 7-10 yrs (12 yrs is a tad on the woody side for me ordinarily), and while this is on the top end of that, it is dead center in terms of what I'm looking for from a wheater. Rich/thick sweetness, and I also usually get cherry covered chocolates from this one. And for the money - it was unbelievable. I miss the days of "just picking one up". I will admit, the first ORVW I ever bought was the 90 proof, and when I finally got the 107, I was amazed that I preferred the 90 over it! Of course, this was in the early days of the journey before my palate was conditioned to higher proof pours. Unfortunately market forces being what they are, I doubt I'll buy another. While I haven't found the current stuff to be a significant shift (keep in my, my basis for comparison is just the last 6 yrs or so), the price has gotten ridiculous for me - and I just don't love it "that much". 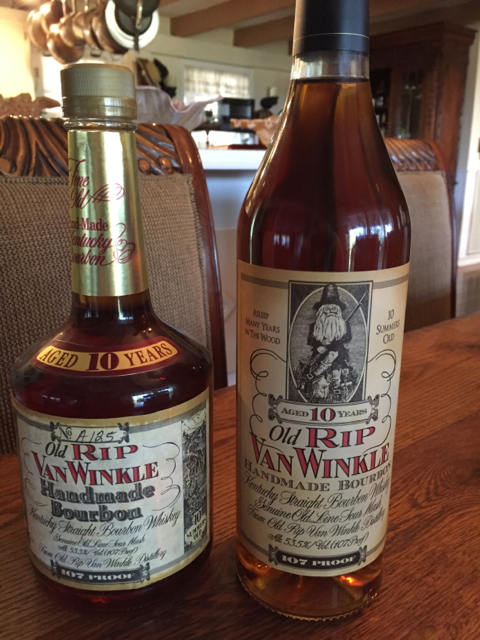 The last 2 bottles of ORVW 107 that I have in the bunker. The squat bottle is from 2007 I believe and the newer one was purchased last fall. On the occasions I have been able to compare ORVW with Lot B I certainly found the Rip to be better. Both I think are a very significant step up from OWA. I will be making a SB blend soon to see how that tastes but will have to compare from memory. I have also felt ORVW was in the running with the 15yr but haven't really ever had enough to give a good comparison. This inspired me to go to the bunker and open one of these (the old squat bottle). It's been awhile since I've had this. This one to me is almost a vanilla bomb. Very creamy and thick, tons of vanilla with some nice spice coming through as Joe mentioned above. Thanks for giving me a nudge to revisit this gem. I'm a fan. A really good bottle of this is right up there with the 15yr expression as being my favorites in the line. My first ever bottle of this from a few years ago was an average batch that wasn't as good as the bottle of OWA (non age stated) that I had open at the time. My current bottle reminds me of some of the better 15's I've had. I've been lucky to find a few of these at retail the past couple years so I have some in the bunker. 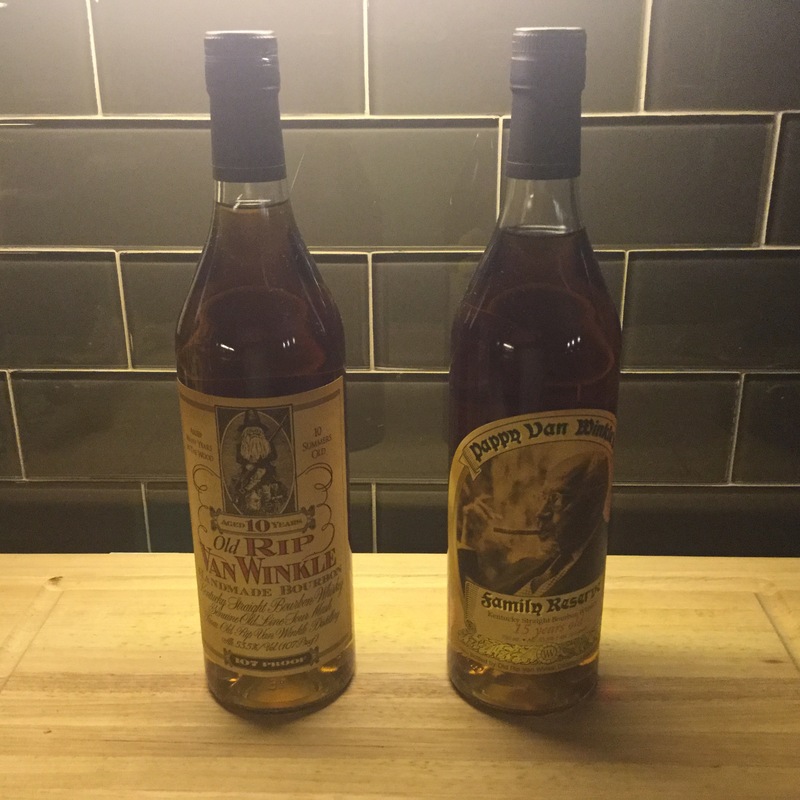 My first ever Van Winkles of any kind were purchased and opened during Christmas season so I've associated them with the holidays ever since. Except for a stray pour here and there, I tend to only drink them during the holiday season which has the benefit of making them last longer. I'll keep my fingers crossed that I'll continue to get lucky finding them while hoping for the boom to subside. Enjoying a pour of this now. Have to say this has often been my favourite of the Van Winkles, I prefer it to the 15 I recently finished. Since people keep comparing to Lot B, I pulled two from boxes. These are both 2015. side-by-side in glencairnes. ORVW slightly darker color. Lot B little stronger, more fragrant nose. Both had very similar flavors. ORVW bolder flavor, little "hotter" - but it's higher proof so that might be expected. Lot B had longer finish, more refined, maybe slightly more mint. I'll finish the evening with both as they are great, but I'm giving the nod to Lot B. Some time later I'll try to dig out an ORVW from 2013 to compare to 2015 Lot B thinking similar barreling years worth comparing. Most people associate PVW as been superior to ORVW. 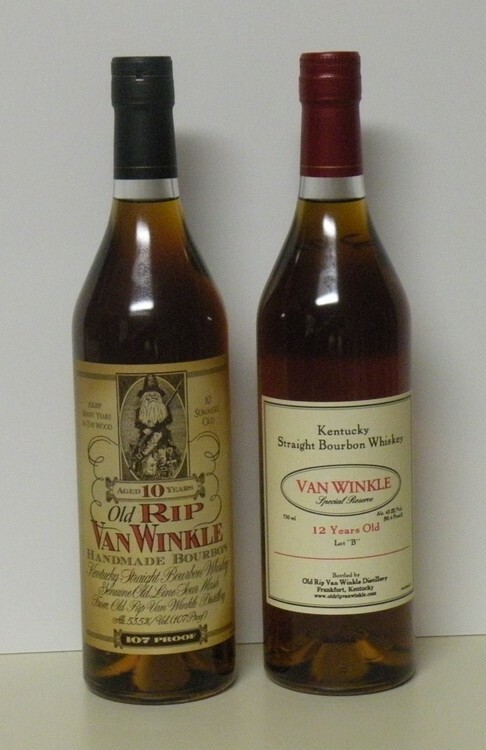 My point is I go for the BTAC and get whatever is left behind in the Van Winkle's. Keep all this info about the 10 being better than the 15 on the down low. I will admit that I have been inspired to do a SBS with the both bottles being from 2015. I have only tried ORVW one time in a sbs with 12 and 15. I did prefer the 10 the 12 but preferred the 15 to both. I have no idea what the years were but if I had to guess they were probably all 2014. The 15 was creamier with a much longer finish. It had more of that old leather nose to it. The 10 was a pretty good pour on its own though. I've been trying for almost 4 years to get one at retail or close to retail and haven't even gotten a sniff at a bottle. Even ran an ad on BS offering stuff for trade towards a bottle and all I got were insults that what I had to offer was crap that no one wants or offers to sell me a bottle at $400+! I was offering things like OWA, W12, ECBP, HWYKY, S-JR, ER10, BSAZ, etc. Found a bottle of ORVW for sale but it was $349.99. I know these are rare but really? As many of you have heard me say on here I am one of those rare guys for whom most wheaters do nothing. I've had this as well as many of its close relatives as follows: 12 yr Lot B, Pappy 20, W12, OWA, and WLW. Out of all those the only ones that tripped my trigger were the OWA, PVW20 and WLW. I can see the allure to the ORVW10, but for some reason it just didn't leave a lasting impression on the palette for me. I remember it having a phenomenal nose, but it just didn't hit me right on the palette.